Business relocation services has recently completed large furniture fittings equipment, handling delivery placement and installation services at the Hydro Majestic Hotel Medlow bath and Greenland’s hotel at 399 Pitt Street Sydney. No matter the size of your project, we offer a fleet of custom relocation fleet of vehicles. Especially constructed storage services to handle any specific requests. Business Relocation Services tailors relocation solutions to ensure the unique needs of your organisation are met. Through our network, our FF & E Teams can manage your FF & E projects. From the receipt of orders and goods whether it be locally supplied or international shipment. Also, our project staff has the ability to receive audit and report. Our storage facilities are able to handle the goods and prepare the scheduled or, staged delivery of FF & E resources found in all hotels, resorts, hospitals, and commercial fit-outs. Our reputation for implementing a high level of project management, while overseeing multiple projects, is renowned throughout the FF&E industry. At Business Relocation Services, you can rest assured that your project manager will implement and deliver your project within agreed timelines and budget. We also have the teams and resources to deliver the Installation of the goods for your project. Most recently we have completed the delivery and installation of all FF & E at Greenland’s hotel. 178 rooms with standard twin configuration through to the Executive Penthouse. 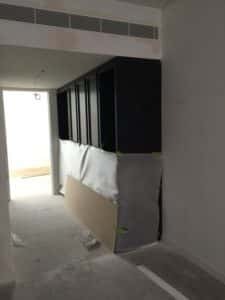 Installation of wardrobes, bar units, Island Benches, Bathroom basins as well as Mirrors to the full veneer wall paneling in the executive suites. Our installation teams have the skills and knowledge to deliver the project. As per the scope issued with the extended ability to handle all the changes that occur.